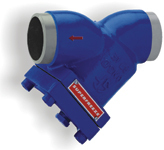 SUPERFREEZE Strainers are designed for either liquid or suction line application. They provide free flow with negligible pressure drop and can be used for a variety of liquids. All SUPERFREEZE Strainers contains the maximum effective screen area. Screen assemblies are seam welded, and the ends reinforced or capped with seal rings. This construction reduces the possibility of bursting the screen assembly. The end of the screen assembly seats against the flange plate to form a tight seal, thereby preventing dirt from bypassing the strainer screen. All cleanable strainers have an access for easy removal of the screen assembly. This facilitates cleaning and inspection. Without breaking the line connection. Strainers are usually close-coupled to solenoid valves, pressure regulators and other flanged valves. Refrigerants : R -717(Ammonia), R-12, R-22, R134a and other common refrigerant.